If someone’s having a party and gifts are involved, I’m the one to bring something food-related. Maybe it’s because I like to give things I like myself and things I’d want to be given… so apparently it’s food. Gift cards to good restaurants, cookbooks, invites to dinner or breakfast at your own place or taking a friend to lunch of coffee make people happy. And those gifts are also fun to give. I made this granola to my sister and her husband, as they are now parents to a really cute baby boy. And that also makes me an aunt now, yay! I didn’t know what to bring to the hospital as I went to see them, so I made some freshly pressed apple cucumber juice. When they got home, I made some raw energy bits with nuts and dates and the next time I brought a jar of this granola with me. So it seems that I’m on my way to become the annoying aunt, who never has “real” candy but serves only raw treats and vegetable juice. Or maybe my nephew will become a big fan of green juice when he grows up a bit, who knows. But regardless what he’ll like, he’s already a super cute dude. I’ve made plenty of granolas before and there are a few recipes here on the blog as well. But when I saw the words ‘banana bread’ and ‘granola’ on the same title, I knew I had to try it. The recipe is from My New Roots Cookbook, which I’ve been reading before going to bed for the past couple of weeks. I’ve been a big fan of Sarah’s blog for years and you might probably know the blog too as it’s so popular. My New Roots is one of my go-to blogs when I’m looking for inspiration or a reliable recipe and I’ve tried many of the blog’s recipes over the years. The book is as wonderful as it gets and I love how the recipes are divided into five seasons, summer split in two phases. 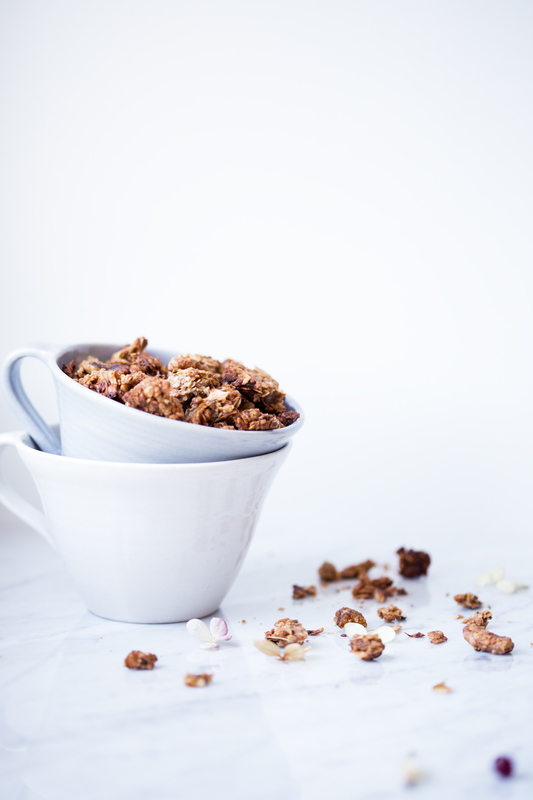 This week has been really chilly, so I jumped right into the winter section of the book and found this recipe for a banana bread granola, that sounded so good I had to try it first. 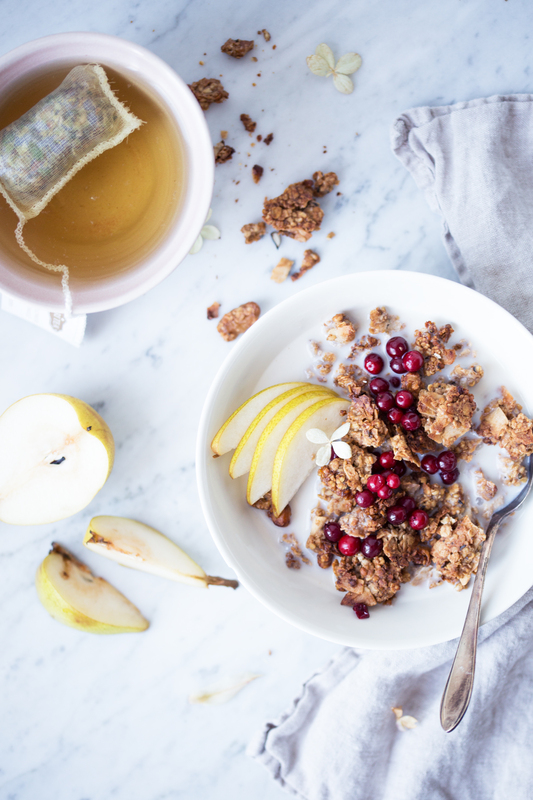 I love banana bread and I love granola, so combining them is just pure magic. And o m g, how addictive can granola be. I’ve caught myself eating the granola straight from the jar a few times already, that’s how good it is. So I’ll just keep this short and say: try it. You’ll love it. And as it’s such a big batch, give a jar to a friend too and make someone happy. As these kinds of small surprises are usually the best kind, and of course, there’s nothing like a good granola. 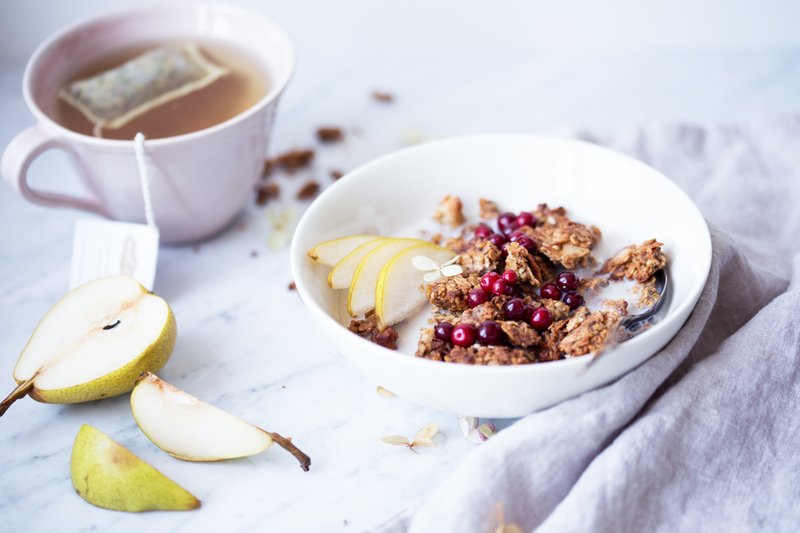 * the original recipe called for buckwheat groat instead of mulberries and sunflower seeds instead of hemp seeds, but I used the things I had in my cupboards and they worked great as well. 1. Preheat the oven to 180 C / 350 F degrees amd line a baking sheet with baking paper. 2. Melt the coconut oil in a small saucepan on low-medium heat. Pour the melted coconut oil into a blender, add the bananas and honey and blend until smooth. 3. 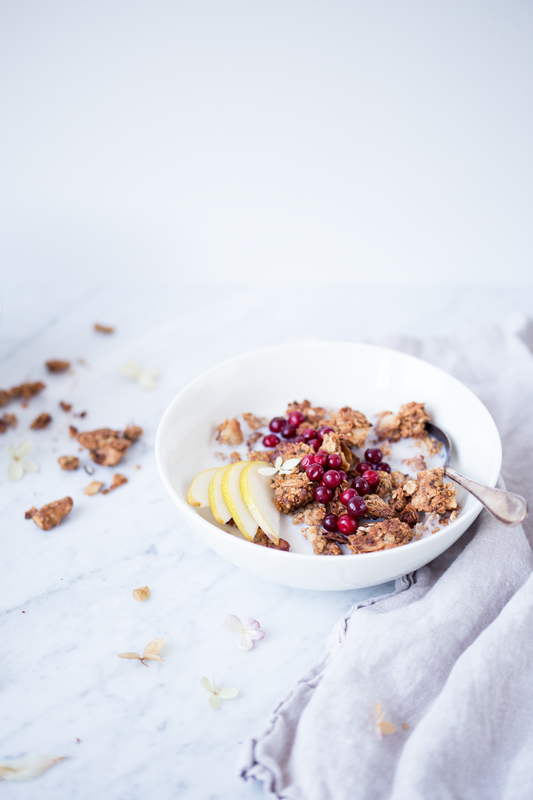 In a large bowl, combine the oats, mulberries, coconut flakes, hemp seeds, cinnamon and salt. Crush the walnuts into smaller pieces and add the as well. Pour the banana mixture over to the dry ingredients and fold to coat. The mixture will be quite wet at this point. 4. 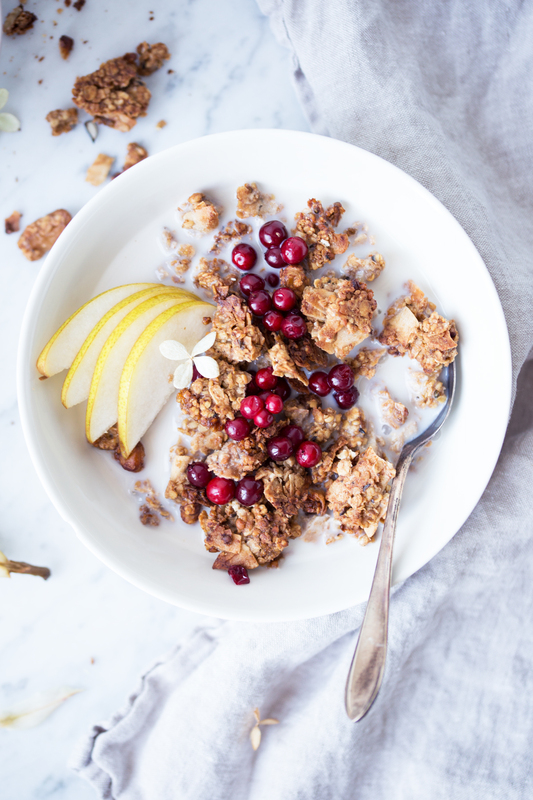 Spread the granola mixture in an even layer to the baking sheet and press firmly with a spatula. Bake the granola for 15 to 20 minutes, until it gets a bit of color. Remove the granola from the oven and flip the granola over in large pieces with the help of a spatula. Return to the oven and bake for another 15-20 minutes flipping every 3-4 minutes and making smaller pieces every time. The granola should be quite crispy when taking out from the oven. Set the granola aside at room temperature to cool. 5. 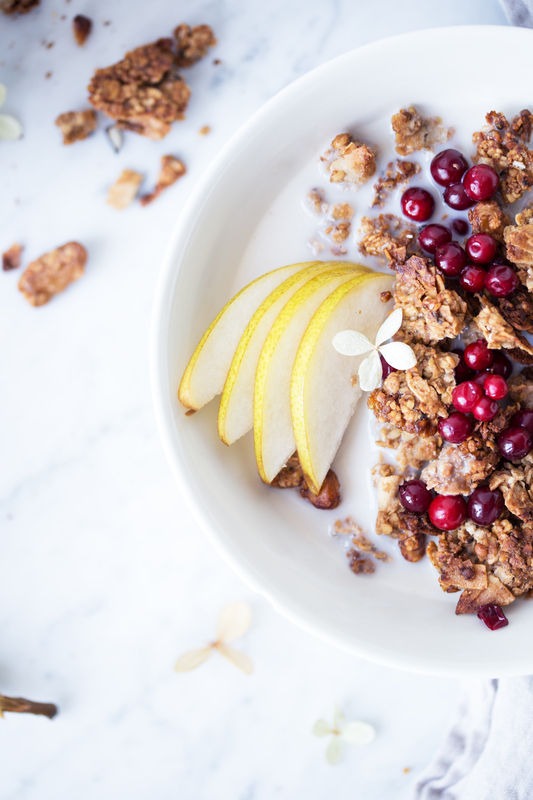 Store the granola in an airtight glass jar at room temperature for up to one month. Tagged autumn, breakfast, granola, snacks.